UPDATE 2/18/2014 – For those who didn’t check them out on Facebook, it is con­firmed that Reloaded, Inc is now in own­er­ship of Hawken. We have some in­ter­est­ing news com­ing from the free to play front to­day. Hawken, a first per­son mech com­bat game from Meteor Entertainment, hasn’t re­ceived a great amount of love from the de­vel­op­ers in 2014. In March CEO Mark Long stepped down as Meteor Entertainment closed the doors to its Seattle, WA of­fice to merge with their Los Angeles, CA of­fice. After this, there was a few qual­i­ty of life im­prove­ments but for­ward de­vel­op­ment of the game came to a stand­still. Later in the year their so­cial me­dia ac­counts went qui­et. The game saw only oc­ca­sion­al bug fix­es as a ded­i­cat­ed and loy­al fan base sat with crick­ets chirp­ing, await­ing the fate of their beloved mech shoot­er. Now we have some info break­ing to re­store faith in those devo­tees of the pol­ished mech com­bat game. Yesterday some­one came by the of­fi­cial Facebook page for Hawken to blow off the dust and to leave a cou­ple of cryp­tic mes­sages for those who were pay­ing at­ten­tion. 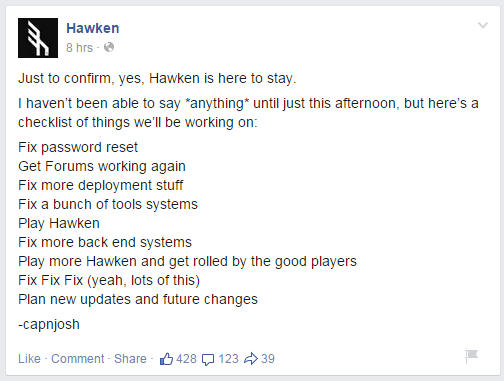 About eight hours lat­er we got this post de­tail­ing some up­com­ing fixes/updates, as well as con­fir­ma­tion of life for Hawken. Encouraging news in­deed for those who are still play­ing the dev stalled Hawken, or those who want to still check out the fan­tas­tic mech fun. It doesn’t end there, though. Looking up who craft­ed the re­cent Facebook post, one cap­n­josh, leads us to LinkedIn where we see that he is an em­ploy­ee of Reloaded, Inc. This ev­i­dence, along with a bit of sleuthing from some in­ves­tiga­tive minds over at the great Hawken sub­red­dit, leads us to be­lieve that these silent up­dates to Hawken have been done by Reloaded, Inc as they were in the tran­si­tion phase of pur­chas­ing the IP from Meteor. If the re­cent posts on Facebook are any­thing to go by, we should be look­ing for­ward to some ex­cit­ing Hawken news in the fu­ture. 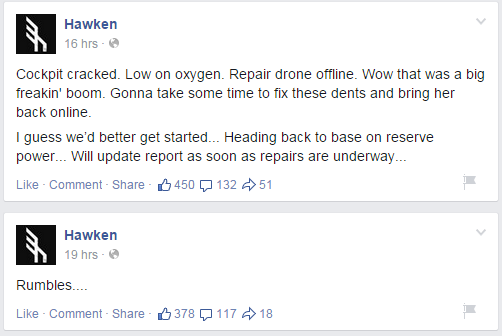 I think it is safe to say at this point that Hawken is get­ting Reloaded.